A Girl and Her eBooks: Second Son - The Prequel to Shattered by Cate Dean - $0.99 Goodie! 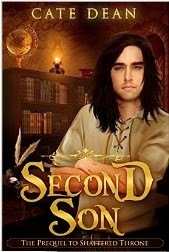 Second Son - The Prequel to Shattered by Cate Dean - $0.99 Goodie! As the second son, Micah Brachon's responsibilities are few, leaving him time for the experiments and inventions that are an important part of his life. All that changes when one of those experiments is rigged to injure him. After Micah discovers that his brother has been threatened, what he first thought were random accidents now have a more sinister slant to them. When the stakes become life-threatening, Micah will need all his skills to save himself from the enemy bent on destroying his brother, and anyone who stands in their path.